County tax assessor in Arizona gets tough on agricultural exemptions; how about yours? Most states give tax breaks to agricultural property, but the privilege can be abused, especially if local or state tax officials are lax about enforcement. In Yavapai County, Ariz., a new tax assessor has revoked about 1,000 examptions and "is reviewing the 2,963 properties listed on the county's agriculture property list to find out who is legitimate and who is not," Bruce Colbert reports for The Daily Courier in Prescott. Maybe it's time to check on the ag exemptions and enforcement in your locality. Assessor Pamela Pearsall "said that she knows some residents are reaping tax benefits from illegal agriculture classifications, and she intends to find them and get them off the county's ag list," Colbert writes. "The monetary stakes are high. For example, a person owns a 40-acre parcel and the assessor's office values it at $200,000. That equals $5,000 per acre, which is the value on which that the owner would pay taxes. However, with a grazing exemption, the assessor values the 40 acres at $7.50 per acre, which puts that 40-acre parcel at a value of $300." We think it's time for rural newspapers and broadcast stations to disabuse their readers, listeners and viewers of the notion that President Barack Obama plans to take their guns away. There is absolutely no evidence of that, despite commercials you may hear from gun shows or the assertions you hear and read from Second Amendment advocates on talk radio and Web sites. Generally, Democrats have learned that gun control is politically problematic. "Gun control advocates are, frankly, disappointed in the president’s unwillingness to move ahead on even the mildest of gun control measures," which he endorsed in his campaign, Bob Herbert writes in The New York Times. Hebert writes, "Even with the murders that have already occurred, Americans are not paying enough attention to the frightening connection between the right-wing hate-mongers who continue to slither among us and the gun crazies who believe a well-aimed bullet is the ticket to all their dreams." Hebert's column is normally available only to newspapers that buy it, but we bet the Times would grant permission for a one-time publication. If you don't want to do that, or Herbert or the Times are too liberal for your taste, plenty of online material is available to help you write a story or commmentary from whatever point of view you have. Two of the best sources are FactCheck.org and PolitiFact.com, which have been debunking these tales since the National Rifle Association started distorting Obama's record and platform when he was running for president. Obama said during his campaign that he would reinstate the assault weapons ban, "go back after kitchen-table dealers, and work to end the gun-show and Internet sales loopholes. In the first year, I intend to work with Congress on a national no-carry law, one-gun-a-month purchase limits, and bans on all semi-automatic guns." To some people, that's heavy gun control. But it's not taking away people's guns. Let's give them the facts. "County fair and livestock show operators across the country have reported strong attendance numbers this spring and early this summer," Martin writes. "Why? Experts suggest that in tough economic times, Americans turn to county fairs for nearby, inexpensive, convenient and family-friendly entertainment." Had a notion you might like to own a small newspaper? Wondering if that's rational, in light of all the talk doubting the future of newspapers? Actually, now is a good time to buy a small paper, says a broker who makes his living putting together newspaper deals. Small- and medium-sized newspapers are selling at historically low multiples of earnings before interest, taxes, depreciation and amortization (debt payments), "according to John Cribb, managing director of Cribb, Greene & Associates," reports Editor & Publisher. The multiples are four to eight times EBITDA, compared to 10 to 14 "not so long ago," and the lowest since brokers started keeping track, Mark Fitzgerald writes on E&P's Fitz & Jen blog. Community newspapers' revenue has declined during the recession, but much less than metropolitan newspapers, we reported in March. 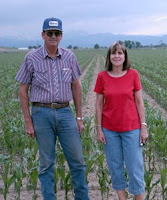 With bright eyes, they recall the nature of their father, who grew up on a farm in Kansas and never left the business. “He was a hard worker and enjoyed what he did. He always tried to give it his best shot. He said, if you can’t do your best, don’t even try,” Kent told Hamilton. 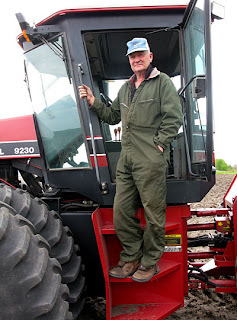 Among the memories of tractor driving and childhood antics, the pair credit their father with teaching them the love of the land; the difficult nature of farming and the beauty that came after. Falling prices, oversupply, and an image-tainting salmonella outbreak in 2008 will likely result in a severe decrease of peanut acreage in 2009. Industry leaders and economists have called for a 25 to 30 percent cut in production to try and compensate for the events of the past year, and some farmers are bypassing the crop altogether, Roy Roberson reports for Southeast Farm Press. In the past, contract prices for peanuts were a result of oversupply, and even then most came in above $500 a ton. 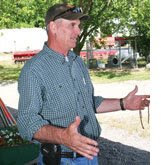 Roberson reports that early in the planting season, the average price for the four peanut types grown in the U.S. hovered around $425 – enough to make a profit, but rarely enough to also pay for crop insurance, North Carolina peanut specialist David Jordan told Roberson. Since then, the average has likely decreased further, and for some growers, contracts can come with reduced pounds. Landowners in Iowa are recognizing that banding together may give them leverage in negotiations on wind-turbine placement as the wind energy market booms. Douglas Burns reports for the Daily Yonder that it may have been more beneficial to work individually in the past, but now federal incentives and arrangements mean working as a group may yield better profits. "House Democrats are on the verge of a deal with rebelling Farm Belt legislators on a climate-change bill," Ian Talley reports for The Wall Street Journal. "Lawmakers and industry officials close to the negotiations said the two sides could reach an agreement within days, under which rural utilities could receive a small share of free emission credits -- less than 1 percent of the total that would be handed out. The credits allow the holder to emit a certain amount of greenhouse gases." Co-ops get 80 percent of their power from coal. As reported here early this week, the point man for rural Democrats on the issue, Agriculture Committee Chairman Collin Peterson of Minnesota, said rural electric cooperatives' problem with the climate bill was more significant than issues raised by farmers. However, the pending deal would also "appease Farm Belt lawmakers," Talley writes, by giving the Agriculture Department "greater involvement in oversight of the market" for credits. That's something Agriculture Secretary Tom Vilsack said he wanted during a visit to Kentucky last month. Christa Marshall of ClimateWire has a more pessimistic report, for The New York Times: "Yesterday, resolution on the issue appeared distant. According to Peterson, Rep. Rick Boucher (D-Va.) offered a tweak in the legislative language that would be more favorable to co-ops, but it didn't 'do much' to move things along. English echoed that sentiment yesterday, and said no further meetings were planned between himself, Markey, Waxman and Peterson." Health-insurance reform is not going to be pretty for anyone, but it will require a special leap of faith from those in rural America, an editorial in the McCook Daily Gazette of Nebraska says, showing how small-circulation newspapers (in this case, 6,000) can and should weigh in on important national issues. Among the changes discussed are plans to cut up to $300 billion from current levels of Medicare and Medicaid spending over the next decade, the adoption of new technologies and improved disease-management systems, and finding ways to address the geographic differences in Medicare spending. But, the editorial notes that federal health-insurance plans already pay doctors 20 to 40 percent less than private insurance. To make up for the difference, every family covered privately is billed an extra $1,800. About a decade ago, a dilapidated town of 26,000 ridden with drug dealing and prostitution began re-examining and renovating its image. Today, the effort has paid off. Josh Noel reports for the Chicago Tribune that the quilt capital of the world, Paducah, Ky., has traded in its broken sidewalks and ghoulish mood for a tourism industry that hinges on the city’s new cultural scene. That enthusiasm carried the renovation efforts. Today, restaurants, art galleries, cafes and cozy lodgings make the vitality, economy and culture of Paducah extend beyond quilts. 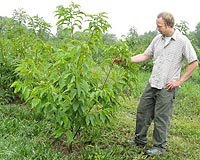 Introducing a hybrid chestnut tree could repopulate American forests with the species while decreasing carbon-dioxide levels in the atmosphere, Terra Daily reports about a study by Purdue University. In the early 20th century, a fungus rapidly spread throughout the American chestnut range and nearly eliminated the species. But a few trees proved resistant to the blight, and crossing them with the smaller Chinese chestnut has produced a hybrid. "We're really quite close to having a blight-resistant hybrid that can be reintroduced into eastern forests," said Douglass Jacobs, an associate professor of forestry and natural resources at Purdue (university photo). Newspapers in California, a state that often sets trends for the rest of the nation, have beaten back a bill that would have allowed local governments to publish new ordinances on government Web sites rather than publishing a summary in a general-circulation newspaper. Newspapers, especially those in rural areas, see such legislation as a threat to their revenue bases and to government transparency. The California Newspaper Publishers Association credited "the many letters and personal communications between CNPA members and the five senators on the Senate Local Government Committee" for the panel's unamimous decision this week to sit on the bill. "Before holding the bill, each committee member spoke about the importance of community newspapers in informing citizens, especially in rural communities," reports the CNPA Legislative Bulletin. "Three of the members said that in the future changes in the way people receive information brought by the Internet and technology might cause them to reconsider the bill." For more information contact CNPA General Counsel Tom Newton at 916.288.6015 or tom@cnpa.com. The latest victims of the economic crisis are communities forced to cancel Fourth of July festivities across the country, particularly in small towns with limited resources. Eli Saslow reports for The Washington Post that more than 40 communities have already called off events, but some citizens in Shippensburg, Pa., are not letting the traditions end without a fight. Every year since 1940, the town of 5,600 people has celebrated its self-proclaimed “Best Day of Summer” with free soft drinks, local high school football and lots of fireworks. But this year, the events would cost $5,300, even at a special discounted rate, and that may be too much in the wake of budget cuts and lost sponsors. Instead, Kip Fordney, head of the parks and recreation department, is going door to door to raise money for the fireworks. The nostalgia, patriotism and town pride keep her going. "It's like Woodstock," she told Saslow of the annual festivities. "Everybody's happy, and everybody's a little bit wild." Rural Americans continue to adopt high-speed Internet service at increasing rates, but seem to be making relatively little headway in catching up to the rest of the country, which is likewise embracing broadband quickly. This year's survey for the Pew Internet and American Life Project found that 46 percent of rural Americans had broaband at home, compared to 67 percent in counties that are part of metropolitan areas. The figures last spring were 38 percent and 59 percent, respectively. The disparity lessened a bit; this year's rural figure was 68.7 percent of the non-rural, up from 64.4 percent last year. The figures are not certain, because the poll's margin of error was plus or minus 2 percent. Still, "Rural residence remains one of the strongest predictors that a household will lack broadband access," Bill Bishop notes for the Daily Yonder. The strongest demographic factor is lack of a high-school diploma, followed by age 65 or over, then rurality. Bishop offers survey findings about rural broadband: "Rural residents are much more likely to have DSL connections than cable [and] are much more likely than those living in cities to use home dial-up to connect to the Internet. Only 12 percent of home broadband users live in rural America. However, 32 percent of home dial-up users live in rural communities." Just 7 percent of U.S. broadband users are on dial-up. "The two groups most likely to say they would like to switch from dial-up to broadband were parents with minor children and people in rural communities." (Read more) To read the Pew report, click here. President Obama is facing a potential rebellion from rural Democrats upset by administration decisions "on everything from greenhouse gases to car dealerships," Politico reports. "A rural revolt could hamper the administration’s ability to pass climate change and health care legislation before the August recess." The story touches on topics already covered here: Obama's non-starter plan for an income-based limit on direct paymentsto farmers; farmers' desire for carbon credits monitored by the Department of Agriculture, ethanol producers' wish to not have faraway land-use decisions count against the sustainability of their product, and lawmakers' inability to understand why General Motors and Chrysler had to close many rural car dealerships, a strategy at least tacitly endorsed by the White House Auto Task Force. 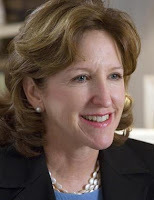 “None of us can quite understand why they consider dealerships a drag when they are the ones that buy the cars, that take the financial risks,” said North Carolina Sen. Kay Hagan. Many of the dealerships that are being closed are profitable.” For a Washington Post database of dealers Chrysler dropped, click here; GM has issued only a list of number of dealers to be dropped in each state. The undersigned told reporter Martin that the closing of car dealerships in small towns is nothing new, because the car makers have been dropping rural franchises for decades, but this round is a huge acceleration and expansion, involving larger towns. That nuance wasn't used in the story, but a more direct political point was. You can read it here. Washington State University is closing its Department of Community and Rural Sociology, as planned, because there are no students majoring in the subject, and making other rural-related cuts, Nicholas Geranios of The Associated Press reports, citing an advance copy of a news release from the school in Pullman (Encarta map). The department is known for its research, teaching and extension work. The WSU College of Agricultural, Human and Natural Resource Sciences "will consolidate some majors and eliminate the international marketing program for farm products," AP reports. "The Cooperative Extension program will close all nine of its learning centers across the state and will make other staff cuts." UPDATE, June 18: President Obama's nominee to head the Federal Communications Commission said the FCC will investigate a complaint by rural wireless companies asking for a ban on exclusive phone deals, reports Amy Schatz of The Wall Street Journal. "Rural America is suffering from a deficiency of top-tier smartphones, according to a number of small wireless operators and advocacy groups," Sarah Reedy reports for Telephony. The companies and organizations such as Public Knowledge are objecting to exclusivity deals, in which only one carrier is available on a type of mobile device: AT&T on iPhones and Verizon on BlackBerrys, for example. "AT&T has gained 2.5 million subscribers since Apple launched the iPhone two years ago, a small number compared with the 270 million cellphone subscribers in the United States," notes Cecilia Kang of The Washington Post. "But such gains have been at the expense of ... small regional network operators, which are losing customers to the biggest carriers – which are now serving seven out of 10 cellphone users." For Kang's coverage of the Senate Commerce Committee hearing today on the issue, click here. The allocation of carbon allowances to electric utilities has become a bigger problem for the climate-change bill than agriculture issues, House Agriculture Committee Chairman Collin Peterson of Minnesota told The Hill yesterday. As we reported last week, rural electric cooperatives, which get 80 percent of their power from coal, say the bill is unfair to them and their customer-members. “This has created a big revolt with the members. I just had probably six or seven of them come up to me — including three committee chairmen — talking about this,” Peterson told Jared Allen of the Hill. Allen reports that Peterson has become the point man for Democrats wanting changes in the bill because he has access to its main sponsor, Rep. Henry Waxman of California, chairman of the House Energy and Commerce Committee. The other sponsor is Rep. Edward Markey of Massachusetts. “It looks to us that they made a deal on the two coasts with the big guys and didn’t think about [farmers and the Midwest],” Peterson said. “So this, I would say right now, is a bigger stumbling block for Waxman than the ag stuff.” After meeting with Markey and Rep. Rick Boucher of southwest Virginia, "another Democrat with whom Waxman had to strike a deal in order to move his bill through his panel, Peterson said progress was being made on the electricity and some of the agriculture issues." Boucher said of his rural colleagues' concerns, “I think they are addressable concerns.” (Read more) Meanwhile, a Washington Post editorial sums up the farm issues in climate change. If confirmed by the Senate, federal appeals Judge Sonia Sotomayor would replace Justice David Souter on the U.S. Supreme Court. That would put the first Hispanic on the highest court of the land, but leave it with little if any representation from rural America, Douglas Burns reports for the Daily Yonder. The only justice with rural ties is Clarence Thomas, left, who was born in Pin Point, Ga., but lived there for only six years before moving to Savannah. The other justices come from largely Eastern, Ivy-League backgrounds. Including Sotomayor, four are from the New York City area, two (Antonin Scalia and Samuel Alito) are from Trenton, N.J., two are from California, one is from Chicago, and Chief Justice John Roberts was born in Buffalo, N.Y., and raised in Long Beach, Ind., just outside Chicago. A recent survey for the Country Music Association found that only 50 percent of country music fans have Internet access at home – a fact that has left both executives and artists disheartened at the loss of marketing potential, The Washington Post reports. Younger artists like Taylor Swift maintain a heavy online presence, from MySpace to Facebook, to an official domain through their respective record companies. Some groups, like Lady Antebellum, “owes its very existence to the Internet,” Melinda Newman writes. Even after the band was picked up by a production company, almost a third of their first album sales were digital. Older artists too, are being pushed by producers to expand their online use and fan base. 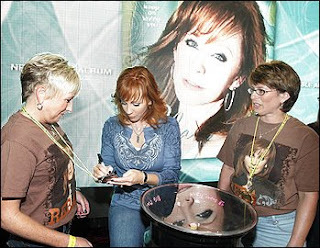 Reba McEntire (signing autographs in photo by Billy Kingsley of The Tennessean) now blogs and is on Twitter, and recently moved her bimonthly newsletter, which used to be mailed to more than 50,000 fans, onto her Web site. In response to increasing violence and substance abuse on Indian reservations, the Justice Department is promising funds to provide better communication and resources to solve crimes, Carrie Johnson reports for The Washington Post. The crime rate among American Indians and Alaska Natives is more than twice the national average, and critics argue that there is a severe disparity between the number of agents and size of the land; fewer than 3,000 tribal and federal agents are responsible for enforcing 55 million acres of territory that houses roughly 560 Native American tribes. The Washington Post attempts this morning to explain the political landscape of tobacco in the top tobacco-producing state, in the wake of a new law authorizing the Food and Drug Administration to regulate tobacco products. The story has useful information, but some key points are missing. Without differentiating between tobacco farming and cigarette manufacturing (the more economically significant of the two), Rucker writes that the North Carolina industry's "economic power has been shrinking. Between 1997 and 2007, the number of tobacco farms here decreased by nearly 80 percent, from 12,586 to 2,622, according to the Agriculture Department." The real importance of that decline was not economic, but political. Tobacco farmers became a much smaller political constituency. And those figures, from the Census of Agriculture, go unexplained. Two big things happened in those 10 years. First, the 1998 settlement between states and cigarette manufacturers, was handwriting on the wall for farmers and accelerated the consolidation of farms whose individual production was limited by government quotas. That accelerated further in 2004, when Congress repealed quotas and price supports. That was even more true in Kentucky, which has long been second in tobacco production but first in the number of farmers. The 2007 census found 8,112 tobacco farms in the state. Rural Americans are disproportionately unable to afford health insurance coverage and often resort to none, Howard Berkes reports for National Public Radio. Many rural residents are self-employed or work for small businesses and farms so spreading the risk is not possible, and individuals are left with increasing deductibles. The situation is frustrating for Larry Harbour, who owns and operates a business in Broken Bow, Neb. He found that even basic insurance for himself and his wife runs $24,000 to $40,000 a year, plus a $2,000 deductible. Now, they go without. “It's like playing Russian roulette,” he told Berkes. “Every day, we wonder when it's going to happen — if something's going to happen, are we able to afford it?" Jon Bailey, of the Nebraska-based Center for Rural Affairs, reports that doctor shortages, increased small businesses, the risks associated with farming and ranching, and a rural population that tends to be older and sicker severely limits coverage. "The two biggest determinants of un-insurance in this country are the owner of a small business or employee of a small business. And that's more common in rural areas." "Power companies are beginning to ratchet back investments in coal-generated plants to take advantage of low gas prices and hedge against costly climate-change legislation," Rebecca Smith and Ben Casselman report. "Natural-gas plants can be built more quickly and inexpensively than coal plants, and they release about half as much carbon dioxide as coal to produce similar amounts of electricity. That could be a big advantage if Congress passes a climate-change bill." As soon as television stations began dropping their analog signals and going all-digital a few months ago, rural viewers began having trouble. Some stations' digital transmitters were in locations different from their analog transmitters, and digital signals have a drop-off effect, in which a signal below a certain strength will result in no picture at all, rather than a snowy picture that a weak analog signal produced. The problem grew Saturday, the first day that full-power stations could no longer broadcast analog signals. "For some people who've already made the switch, the biggest complaint so far is that the digital signals aren't as strong and can break up easily for people who live too far away from TV towers," notes Amy Schatz of The Wall Street Journal. She reports that almost 20 percent of the callers to the Federal Communications Commission national call center "reported reception issues, including lost channels or problems with the digital signals breaking up." Rural Alaskans are using the Internet to share information about the climate and ecosystem changes that are happening around them to better understand how the environment affects their lives. It's a lesson in how rural Americans anywhere can use technology to overcome the obstacles of distance -- which are even greater in the roadless "bush" of Alaska. Alaska Newspapers, a chain of weeklies, reports that the year-old www.nunat.net is a product of the Alaska Inter-Tribal Council, whose executive director, Brad Garness, created and runs the site. “People who live a subsistence hunting and fishing lifestyle generally have a unique view regarding climate change and why animals behave the way they do,” he said. What began as a town social club in rural Tennessee is taking larger civic matters into its own hands: preservation, publicity and community outreach. Suzanne Normand Blackwood reports for The Tennessean that the Triune Community Club in Williamson County, just south of Nashville, has been busy organizing panel discussions, running a rural-themed book club and reinventing how a community can affect the life of a small town in a rapidly subrbanizing area. As agriculture changes and declines, and land-use planning becomes a key topic, the community club is a vehicle for expression and debate about change. The club embraced such issues two years ago to "allow the citizens to have a voice so they can discuss issues that concern them with appropriate agencies and officials," Ginger Shirling, a lifetime member, told Blackwood. If there’s a debate in your town about whether to emphasize recruitment of large employers or smaller entrepreneurs, don’t waste time on the debate; do both, writes Timothy Collins, assistant director of the Illinois Institute for Rural Affairs at Western Illinois University. 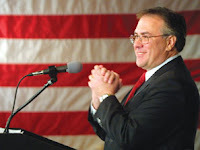 In an article for the Daily Yonder, Collins sides with Ed Bee, president of Taimerica Management Co., who wrote in an article for the Economic Development Journal that there is a need to give up on “one-size-fits-all” approaches. “The push for entrepreneurial development emerged in the 1980s as both a reaction to protracted recession and an alternative to faulty business-attraction strategies that were not meeting the needs of states and their inner cities, smaller towns, and citizens,” Collins writes. But that recession, which reduced rural manufacturing jobs and lowered standards of living, also left such places less appealing to businesses. 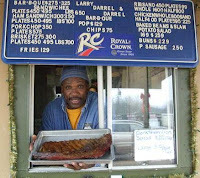 Rural entrepreneurship can provdie a foundation for such areas to fall back on.